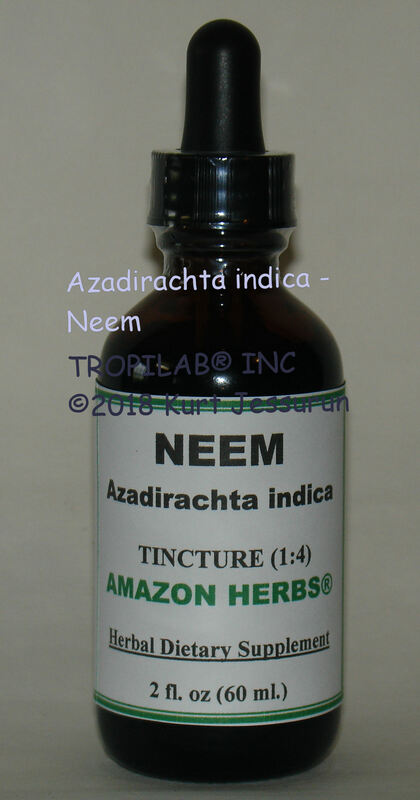 ﻿ NEEM TINCTURE AND MEDICINAL TEA USES, antioxidants - TROPILAB. 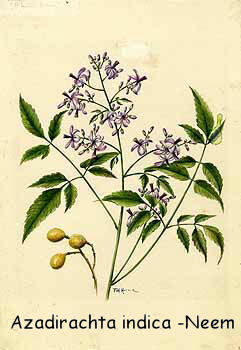 Neem is an Ayurvedic, Unani and Chinese medicinal plant that have been used for thousands of years; originally from India but now also growing abundantly in South America. It is considered as a safe medicinal plant and modulates biological processes without adverse effects. Traditionally, it is mainly used as a general antiseptic and antibacterial against skin diseases, sores and infected wounds. It contains high levels of antioxidants to protect the skin from aging. Other applications are: in the treatment of malaria, improving oral and gastric health. Neem leaf, the most used part, has a wide range of pharmacological activities. Extract include azadirachtin, isomeldenin, nimbin, nimbinin, 6-desacetyllnimbinene, nimbolide, nimbidic acid, nimbandiol, immobile, nimocinol, sodium nimbidate, quercetin, campesterol, stigmasterol and beta-sitosterol. The most active compounds are azadirachtin A-G; azadirachtin E is more effective. Neem is a rich source of antioxidants; the constituents play role in scavenging of free radical generation and prevention of disease pathogenesis. The constituents (phyto-chemicals) have a number of pharmacological effects such as immunomodulatory, anti-inflammatory, antihyperglycaemic, antiviral, antibacterial, analgesic, contraceptive, antimutagenic, anticarcinogenic, antiulcer, antimalarial and hepatoprotective. Neem has a vast array of biologically active compounds that are chemically diverse and structurally complex; more than 140 compounds have been isolated from different parts. The leaves yield quercetin (a polyphenolic flavonoid) nimbosterol (β- sitosterol) as well liminoids. Quercetin has antibacterial and antifungal properties. Fresh matured leaves yield an odorous essential oil, which exhibits antifungal activity. It has also been used for conjunctivitis, piles and fistula; promotes a healthy circulative, respiratory and digestive system. It also may have beneficial effects on decreased liver function, diabetes, heart disease, arthritis, rheumatism, STDs, nerve disorders, mononucleosis, allergies and tuberculosis. Tincture: 1-3 full droppers daily. Do not use when becoming pregnant or breastfeeding. Therapeutics Role of Azadirachta indica (Neem) and Their Active Constituents in Diseases Prevention and Treatment.